Custom step and repeat banners can be a bit of a challenge to have printed by just any print shop. The size and accuracy required to print them makes them a specialty product, and Denver Print Company has established itself as the step and repeat experts. These over-sized banners are great as red carpet backdrops, award ceremony backdrops, event banners, and convention photo drops. 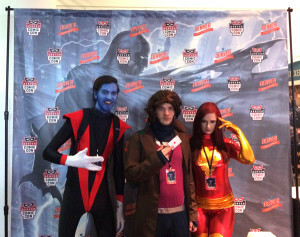 The amount of space they take up makes them ideal as photo backdrops and convention booth set-ups. Event sponsors love the brand exposure, especially when photos of the event guests are tagged on social media sites and shared amongst social-media friends. For a very reasonable price point, you can gather valuable photos with guests and give them all something to talk about. Our step and repeat banners are not only affordable but they are durable and will last for several years if properly cared for and stored. Full-color printing of this size really makes a statement. These banners make great photo backdrops for special events like proms, seminars, church functions and holiday photo shoots. With sizes like 8×8, 8×10 and 10×10 there is a step and repeat banner that matches your goals and budget. If you need help laying out the logos for your step and repeat banner the talented graphic design team at Denver Print Company would be happy to help you with your layout. These banners are so large that hanging them properly can be a small challenge, especially if the set-up is outside. 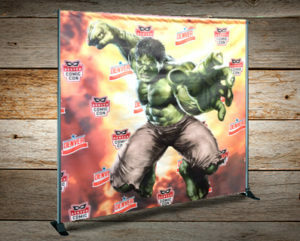 We carry some of the best banner stands that the industry has to offer. Step and repeat banner stands have retractable polls and come with a carrying case for easy travel and storage. Our banner experts would be more than happy to show you the variety of banner stands available. Great for displaying logos or sponsors or participating brands. Hang your step and repeat in a well lit area. Don't make the logos to large. We highly recommend purchasing a banner stand. Evenly spacing the logos will give your step and repeat a much better look. Don't make the logos to large or you risk not having certain logos in camera shots. We offer Rush printing on all step and repeat banners. Vinyl stock may vary so please call ahead. 5 days from the confirmation of digital or printed proof. Who uses step and repeats? © 2019 Denver Printing Company. All Rights Reserved. Powered by WordPress. Created by Muffin group.